This is a stand-alone game, everything you need to play ASL is in this game. All rules/concepts introduced in Starter Kit #1 are included in ASL Starter Kit #2's rulebook. 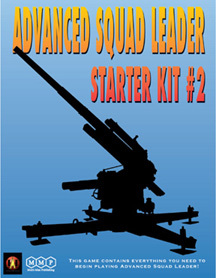 ASL Starter Kit #2 is a self-contained module which will let players start playing Advanced Squad Leader almost immediately. A liberally-illustrated rulebook teaches gamers ASL using a conversational style to teach the concepts of ASL. If you own and play ASL Starter Kit #1 you will be plesantly surprised to find how easy it is to spot the new rules ASLSK#2 adds - we've highlighted the new rules so that you can skip rereading what you've learned in ASLSK#1 and get right to the new rules! What does ASLSK#2 add? GUNS! Artillery pieces. Anti-tank guns. The famous and deadly German "88". Mortars and bazookas! ASLSK#2 adds the "to hit" procedure to the foundation you learned in ASLSK#1. And if you didn't get ASLSK#1? There are two "infantry only" scenarios to get you up to speed! This answers the inevitable question we get with the Starter Kit concept. Do I need ASLSK#2 if I have ASLSK#1? The Starter Kits are self contained. Each has everything you need to play what's in the box, with the higher numbers adding to the ASL knowledge you'll have from playing previous Starter Kits. We do not anticipate changing what you've learned from prior Starter Kits (for example, ASLSK#2 adds about 4 pages of rules to the base built by ASLSK#1). A better question would be "Do I need ASLSK#1 if I buy ASLSK#2?". The short answer is a resounding no! You can dive right in with ASLSK#2. But if you do, and you like the game, ASLSK#1 adds more boards and scenarios (infantry only) for you to enjoy. We know it's a little confusing, we hope this clears it up a bit. Other products in the "Advanced Squad Leader" series.